Rangers supporters have called for full clarity on the club's financial past and future ahead of the release of Graham Wallace's business review. It is due on Friday and fans want "firm commitments" not "vague corporate speak" from the chief executive. The Union of Fans is also pressing ahead with its plans for a season-ticket trust fund. This would pool renewal money that would only be paid to Rangers in return for security over property assets. Wallace announced the launch of his 120-day review at the annual meeting of shareholders in December. The intention was for a thorough examination of the club's business and some staff have already left in the meantime. Wallace has made it clear that costs need to be cut and that future funding will be required. 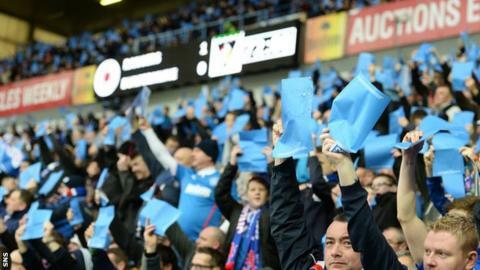 The Union of Fans, a coalition of supporters groups, has called for full disclosure on how the money raised when Rangers International Football Club was launched on the Alternative Investment Market was spent. In February, a £1.5m loan was provided by the shareholders Sandy Easdale and Laxey Partners, although the terms of the agreement with the latter was bettered by another shareholder, George Letham. The fans also want a "comprehensive" breakdown of how further investment will be sought to underpin the club's attempts to return to a position of challenging Celtic at the summit of the Scottish game and competing regularly in Europe. With the season-ticket renewal deadline falling in 12 days, and former director Dave King having urged fans to put their renewal money in the trust fund of which he and Richard Gough are directors, the review is considered a critical moment for Wallace. King also wants to invest in the club as part of a fresh share issue, but has accused the board of "acting in bad faith". "It has now been over four months since Mr Wallace's AGM pledge and we expect, given the length of time it has taken, that this business review will give a full and comprehensive picture of the way forward for the club," said the UoF statement. "We expect to see a full breakdown of how the club arrived at the point where it required to borrow funds simply to complete the current season. "This should include a full breakdown of where the IPO money went. In particular, detail of the sky-high placement costs, related fees and who those fees were paid to and why. "We expect to see full detail of who will be providing the £30-£50m required to take Rangers back to the level we should be operating at, in the absence of this board accepting the offer of investment from Dave King. "We also expect to be told exactly when this will be provided, on what terms and a clear plan of how it will be used to rebuild the club both on and off the park. "We hope that this review will not simply be more, vague, corporate speak from Mr Wallace. We want to see tangible, measurable progress and firm commitments on the huge investment required. "Anything less will be a damp squib, especially since we have already seen that we cannot even rely on public, binding statements from this board." The Union of Fans also revealed that its intention is for the season-ticket trust fund to be open for fans to sign up to before the 6 May renewal deadline. If season-ticket income falls, Rangers will need to seek external funding to keep trading. "We will have a website in place within the next 10 days where fans can register their details and securely place their season-ticket money," the group stated. "This money will only be passed to the club in return for season tickets if security is granted over Ibrox and Auchenhowie. "Those are our only conditions. If that security is not granted then fans will retain their money and can decide themselves how to proceed at the start of the new season." Rangers are also understood to be on the verge of appointing Paul Tyrrell, the former director of communications at Manchester City, Liverpool and Everton, in a consultancy role. During his time at Anfield, Tyrrell was alleged to have written a report comparing some Liverpool supporter groups to Cambodia's Khmer Rouge.